Well, it’s that time of year again in New Orleans. Carnival is over, and it’s not quite Jazz Fest season yet, so we’re of course referring to Gunning for a Cure 2018. Gunning for a Cure is a one-day sporting clays tournament and after-party supporting Dr. Sartor's cutting-edge prostate cancer research at the Tulane Cancer Center. And it’s this Saturday, February 24th! In addition to the actual tournament, the afternoon features a ton of fun activities at picturesque Stella Plantation, including: a “chicken drop” for a Rolex watch (the return of a fan favorite from last year), luncheon provided by 12 Seasons Catering, open bar, live music, wine wall, 3-gun raffle, long shot competition, silent auction, and other games for quality prizes. Luncheon/after-party tickets can be purchased in advance or at the door. For the second year in a row, Saint Hugh is proud to sponsor a women’s shooting team. Last year, we sponsored the event’s first ever all female team and are proud to build on that tradition this year. Plus, keep an eye out for some our some of our best-sellers at the silent auction table! It’s not too late to sign up a team! But if you can’t make it this weekend, you can stay involved by purchasing a 3-gun raffle ticket or simply making a donation. Over the summer, we told you about one of the biggest debates in the outdoor industry: President Trump’s request to review the designation of 27 national monuments. Opponents of the review worried that the protection and conservation of federally owned, undeveloped land was in jeopardy, while proponents saw it as an opportunity to end federal government overreach in their local communities. In August, Secretary of the Interior, Ryan Zinke, completed his review and recommended reducing the size of 6 national monuments. When his reduction memo leaked in September, we found out which six: Big Ears (Utah, whose late-term Obama designation was controversial), Grand Staircase-Escalante (also Utah), Gold Butte (Nevada), Cascade-Siskiyou (Oregon), and two marine monuments in the Pacific Ocean. Zinke also recommended to changes to several other sites, including New Mexico’s Organ Mountains-Desert Peaks and Rio Grande del Norte and Maine’s Katahdin Woods and Waters. President Trump’s request to review was based on what he saw as past presidential overreach in the use of the Antiquities Act, a claim Secretary Zinke appeared to support: “No president should use the authority under the Antiquities Act to restrict public access, prevent hunting and fishing, burden private land, or eliminate traditional land uses, uncles such action is needed to protect.” Zinke declined to comment on whether portions of reduced monuments would be opened up to drilling, mining, logging, or other industrial use. In December, President Trump announced his plans to follow Secretary Zinke’s recommendations and reduce size of certain national monuments, including an 80% reduction to Big Ears and a 45% reduction to Grand Staircase-Escalante. But for now, actions related to reduction appear to be on hold, as President Trump’s decision was quickly met with lawsuits from Native American tribes, conservation groups, and retailers, who claim the President doesn’t have the authority to make the proposed changes. On 19 occasions, past presidents have reduced the size of existing national monuments, but those reductions were smaller than those proposed by Trump and were typically offset by enlargements elsewhere. If, like me, you’re still cleaning out your freezer from last year, this is a great simple recipe to just throw in the crockpot for an easy work night or weekend meal. Rub the outside of the birds with olive oil, salt and pepper to taste, and the grated orange. Stuff their cavities with trimmed thyme and parsley and minced garlic. 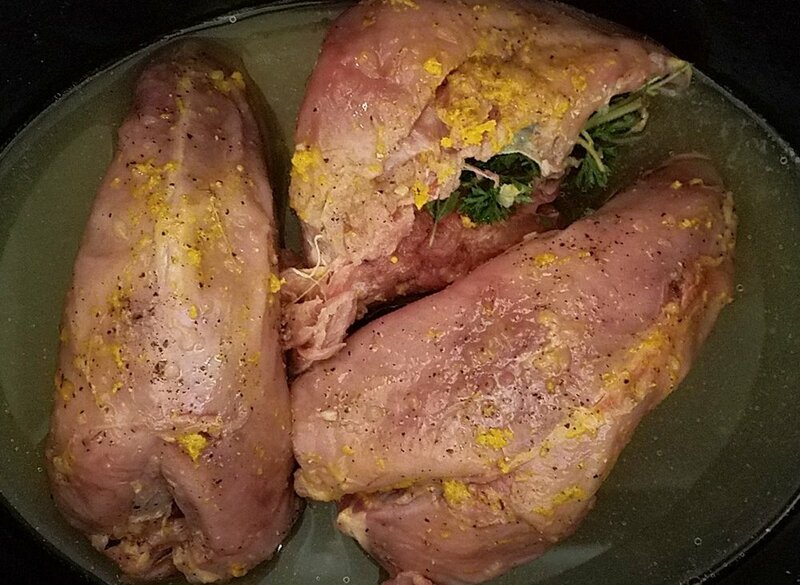 Place the birds in the crockpot. Halve the grated orange and squeeze it over the birds. Squeeze any remaining remining juice into crockpot. Cook on high for 3 ½ hours, then on low for 1 – 1 ½ hours. Mid-September means teal season in Louisiana. While we’re excited simply to be back in the marsh calling birds and taking shots, we wanted to spend a moment taking a closer look at these colorfully feathered fowl. Teal are dabbling ducks, spending most of their time in shallow, primarily freshwater ponds and wetlands. The three most common varieties of teal are: blue-winged, green-winged, and cinnamon. Teal are smaller than most other duck species, characterized by their short necks and tails. Blue-winged teal are the second most abundant duck in North America (behind the mallard), though their population fluctuates with water conditions and the availability of wetlands. Because they are less cold tolerant than other duck species, teal tend to migrate further south in the winter, sometimes venturing well into northern South America. Their migration starts earlier due to this longer journey. Many hunters consider teal to be the fastest of duck species, but the red-breasted merganser actually hold that title, having clocked in at 100 mph. Teal taste less gamey than diving duck species, so many people prefer to marinate and roast them. We shared one of our favorite roasted duck recipes on this blog last fall, and you can find it here.